My parents and I went to Long’s Noodle House to celebrate Chinese New Year. When we go out and eat, we normally each pick a dish or two. Patch and I usually pick the regular dishes and my mom likes to try new things. Lots of food tonight! To start, we had the hot & sour soup. Surprisingly, we’ve never had the soup here before so we ordered it tonight. It was just okay. It was peppery, more towards the white pepper taste and not very spicy. I know a good hot & sour soup when I have it. 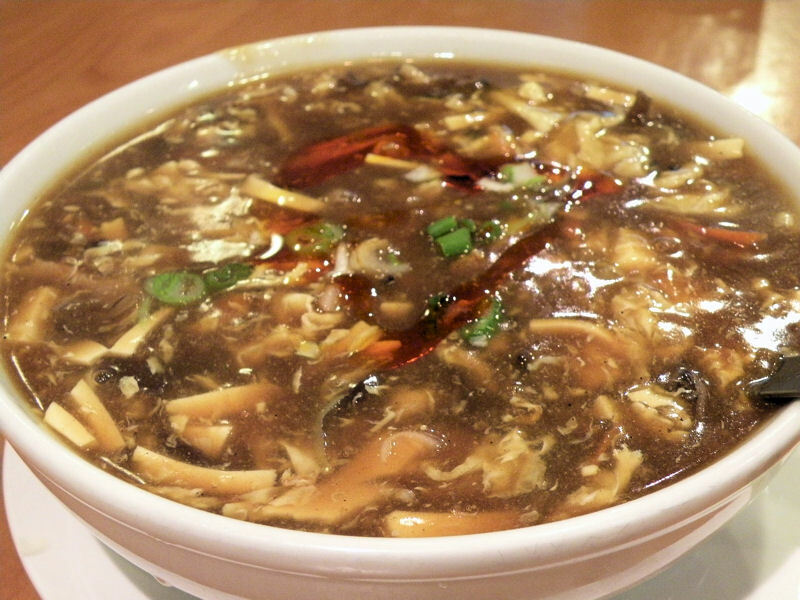 My favourite hot & sour soup is from the original Mui Loong Chun’s on Kingsway (by the now-gone Dragon’s Inn Smorgasboard and across from the now-gone Wally’s burgers) but Ningtu is not bad too. 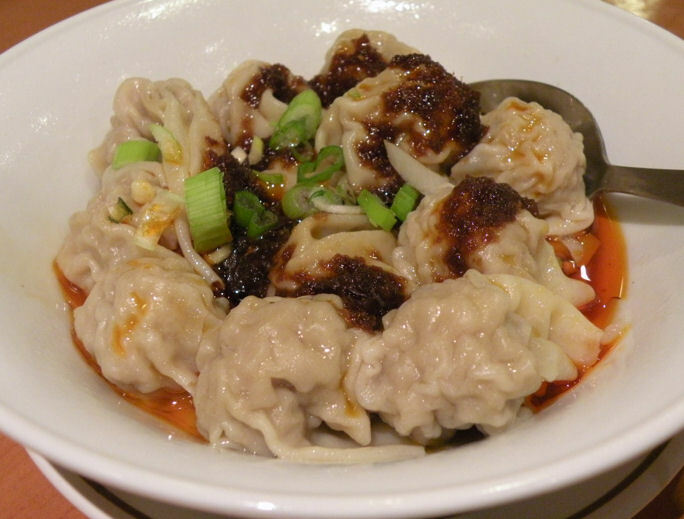 The wonton in spicy sauce (hoown yau chau sau) was good, prepared the way I like it, with enough chili oil and green onions. Patch likes the wontons from The Place (on Granville street) better as it was unique and made with lots of peanut sauce. I like my wontons chili oily and not peanuty. And my mom’s selection… it gets better. I would say this was the main star of the night. On the English menu, this dish is not very descriptive. It just says pork with assorted spice. I don’t know what spice it is though. Breaking apart the piping hot pork hock. 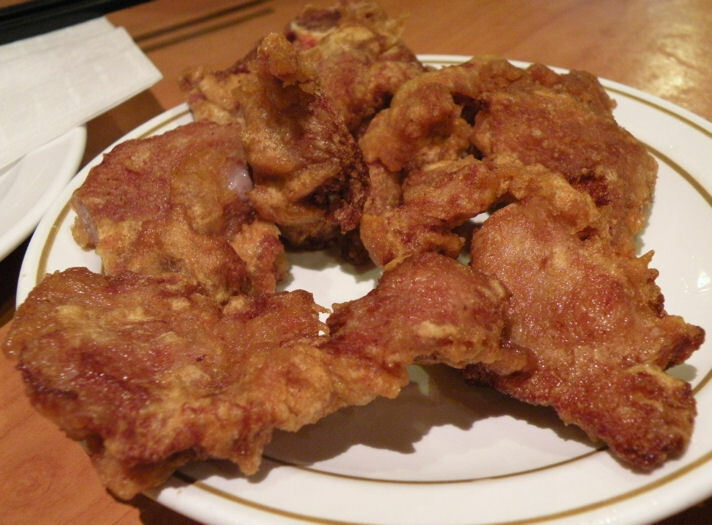 The pork was fall-off-the-bone tender. Lots of fatty skin soaking up the juices. The juice (jup) is thick enough that you can dip bread without it dripping all over or to mix into rice. 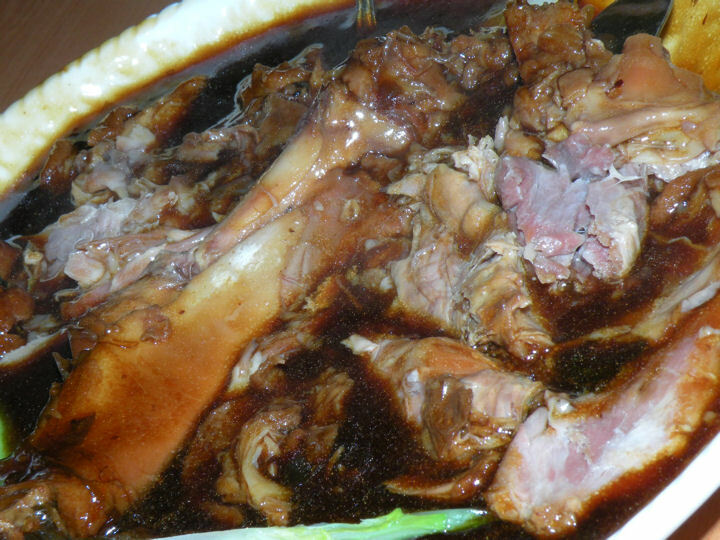 But it is oily but then if you don’t like oily foods, pork is not your friend. My mom called ahead to reserve one but I don’t know if people reserve it normally. I guess people do that for food that takes a long time to prepare (ie calling in for baked tapioca, or winter melon soup in a melon, etc). Stuffing the fried roll with pulled pork. 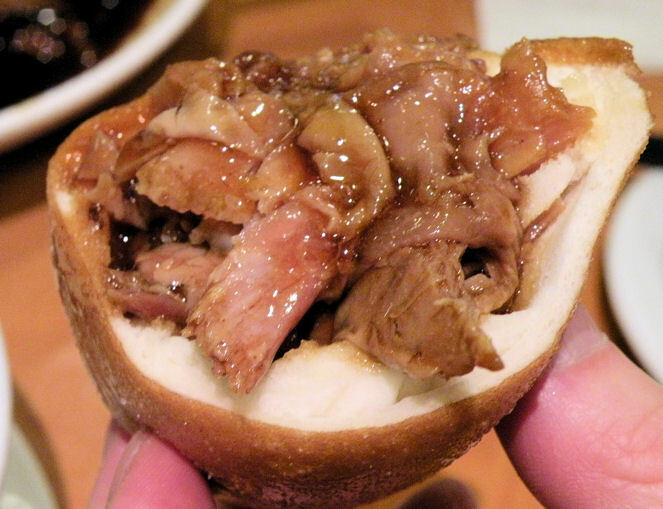 Patch and I got a little creative and made a little sandwich with the pork and sauce. IT.WAS.SO.GOOD. I ate 2 rolls since I needed to save space to finish up the soup and wontons. Even though it was oily, it didn’t feel heavy, not even after the meal. For mushroom lovers, this dish is not bad and it’s a good portion for the small price. 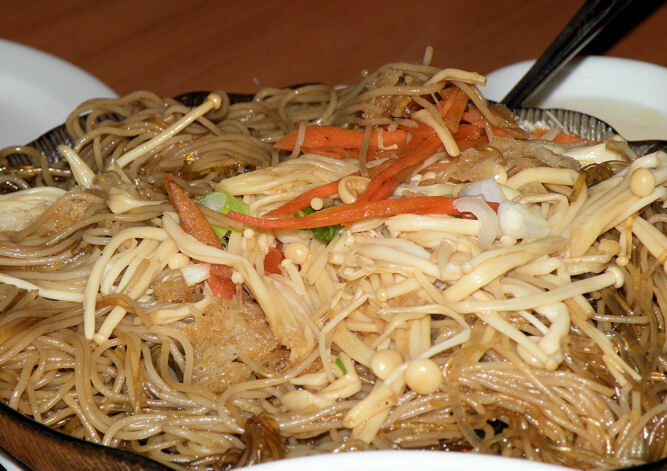 It’s a mix of vermicelli and bean thread (fun see) with chinese mushroom and lots of enoki mushrooms. 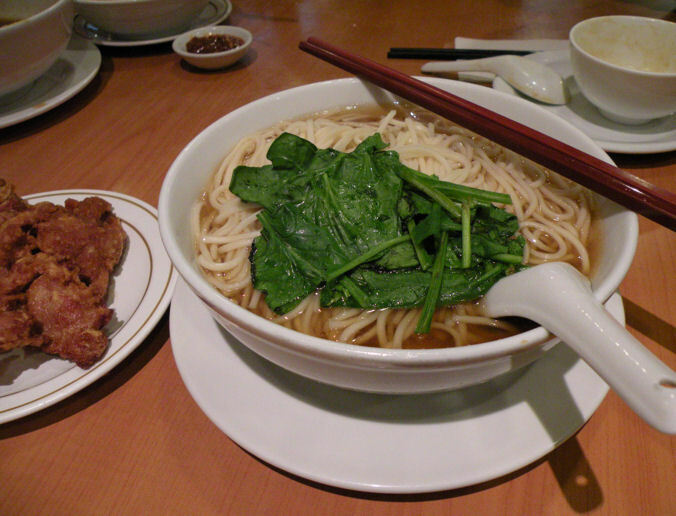 Mix them together with the green onions and it’s a simple noodle dish. 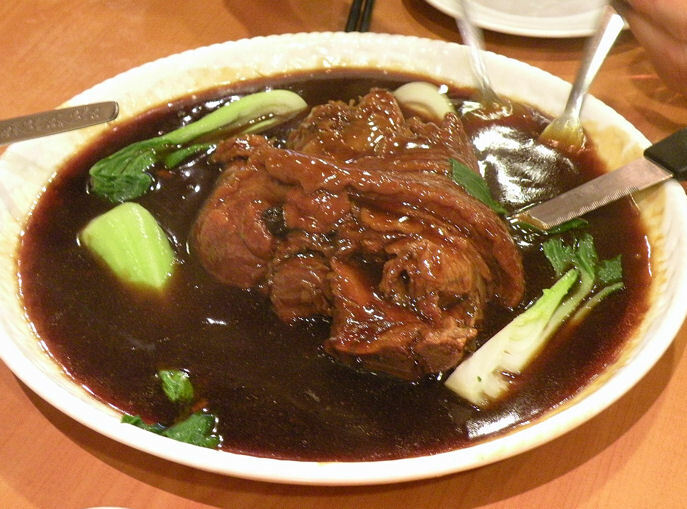 Pork fat, pork sauce and noodles. 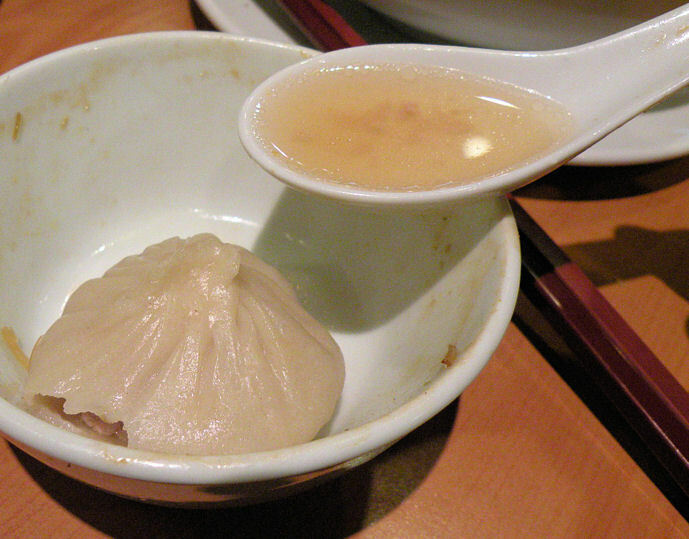 Their Xiao Long Baos holds its juice (haha) but it's not the best ones I've had. Overall, I like this restaurant because it’s affordable and the food is consistently good. Posted on February 17, 2011, in Vancouver Eats and tagged east vancouver, main street, restaurant reviews, shanghai food, vancouver. Bookmark the permalink. Leave a comment.